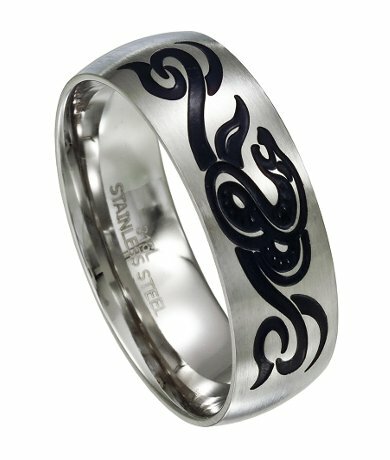 This 316L stainless steel ring features a serpent design in black enamel. The desigh is on one side of the ring only. 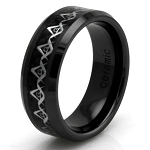 A great ring for your tribal collection. Don't do anything with lots of soap and water,because the black with strip out and peel away...but hey, Its only $19 so its not big deal, because you can still see the design and it does not turn my finger green, and I wear it almost everyday. Searching on the internet and looking for a unique ring I landed on the JMR site and found this ring. The ring has comfort fit and looks great! Buy it and you won't regret it! I enjoy this ring. I think it is young & hip. It is not thick like some other rings I have tried; this makes it more comfortable to wear (in my opinion). JMR staff were very helpful and called me to ask additional questions.